Pricing a job is one of the more difficult things for new start-ups. You don't want to over-charge, but you don't want to under-charge either. If your price is too high, people will look to someone else. If it is too low, you may not make enough profit to keep you going. It is hard to raise your prices once they are established without upsetting your customers. This page is designed to get you to think outside the box and look at the effects of pricing a job incorrectly. It hopefully will show you how to save money on expenses and get the price you need. The first thing you have probably noticed is that lawn care these days is extremely competitive making pricing a job intimidating at first. Our economy is not helping. What adds to the complexity is that many individuals have started a part-time lawn mowing business to help bring in extra money. They often work under the table just for the cash. Some of these have made a practice of pricing low to get the job. However, while it is great for the customer, a lot of customers are aware of this (though may not admit it) and understand that people that are not in it for the long haul are often not in business long. You will see why as you read this. Secondly, it is important to know that times have changed and price really does matters more than ever. People are now geared to look for a low price, especially people on fixed incomes. Who can blame them? Keep in mind, if you have a prospect who only cares that his lawn is cut so the neighbors don't complain, they will take the lowest price offered, regardless of the quality. More discriminating customers will want good quality, but still are on the lookout for a decent price. If you have established customers that are happy with your work and you show up on time, you usually have them for a long time. It pays to do a good job no matter what and develop a good working relationship with your customers. While it is still necessary to determine costs to stay ahead, here is the problem: Most likely the prices are already established. In most towns and subdivisions where lawns are basically the same size and general shape, established companies have already determined the price. You may be able to deviate from the price somewhat by going higher, but not too far. For example, if the average price is $45.00 for mowing a lawn, you may be able to charge $55.00. Since you are doing the exact same work as other people, i.e. mowing, weedeating, blowing the sidewalk, etc. people will not pay much more than the going price. I have heard business owners complain, "It doesn't matter if I have a $10,000 John Deere Mower or a $100 push mower, I still have to stay within a 15% price range of what everyone else is charging or I will lose work." Here is a true story. You may be amazed how many people get into this situation. The mower you see in the picture at the top of the page is mine. I bought it from John Deere as a used mower. I knew the person who traded it in (we will call him "Mark"), so I also knew the mower was in excellent condition. Mark felt the older mower was not suitable for his future plans. Mark wanted to expand, so he bought a brand new John Deere. In fact, he financed two large zero-turn mowers with grass catchers. He also bought a goose neck trailer equipped with a custom-made ramp he designed himself. The trailer had a huge steel grass and leaf container tank mounted on his trailer. The ramp went to the top of the 6 ft tall tank, so he could unload a lot of lawn debris before needing to dump the tank. It was incredible. He had at least $30,000 in all his equipment. For whatever reason, Mark worked alone and had no employees. He had to work from daylight to sundown seven day a week just to cover his expenses and to make enough profit to pay house bills, food, clothes for the kids, etc. In fact, he mowed the lawn at the Caterpillar Plant at night using only the headlights from his mower to see. He had no choice, he was too far in debt. Eventually, Mark gave it up, sold his equipment and got another job. He told me the stress was way too much for him. He couldn't mow enough lawns to cover all his expenses, maintain his equipment, and still enjoy his very infrequent time off. "Roger" needed extra income. He had all the equipment he needed to start a lawn business. His older model riding mower was in good shape and he didn't need many lawns. He did upgrade his trimmer to a professional model and bought a trailer to carry his riding mower. His goal was to get 8 to 10 lawns and mow after work and on weekends. He charged $25 for a small lawn and $35 for a large lawn. The price was not based on established prices, but rather the weekly total really sounded good to him. Roger knew his prices were lower than everybody else, but since his situation was different it didn't matter to him. Experience is a great teacher. He quickly realized he needed a push mower to get into places his riding mower couldn't. A couple homes had gates too small for his riding mower to fit through. It was too time consuming to use the trimmer for those larger areas and the push mower would do a better job. He borrowed the homeowner's push mower a couple time, but knew that wasn't how it was supposed to work. He purchased the mower for $250. To make matters worse, during periods of heavy rain the grass grew too fast. Customers started complaining when he couldn't get over soon enough to mow. To satisfy his customers he would come over before work to mow the small lawns. The grass was wet from heavy dew and would catch under the mower. He spend too much time scraping the grass from the bottom of the mower deck. The grass looked terrible with the globs of grass everywhere. This bogged the old riding mower down. His over-worked old riding mower eventually had enough and he had to buy a new riding mower. That was another $2000 expense he didn't count on. What Roger found is that he didn't charge enough to cover the unexpected costs in running a business. His idea of pricing a job only included how much extra money he needed to make life easier and didn't think of it as an actual business. Roger finally quit when he realized his expenses, normal business problems, and a lack of free time far exceeded any benefit from the extra money he was bring in. There are always expenses in running a business. The most important thing you can do is to find ways of keeping the expenses down. For example, try to buy smart. Equipment cost is an important consideration when pricing a job. Here is an example of cutting cost. Instead of purchasing a new mower at the dealer, look for auctions. Out here in Missouri, there are always a lot estate auctions. I have purchased many pieces of equipment this way. 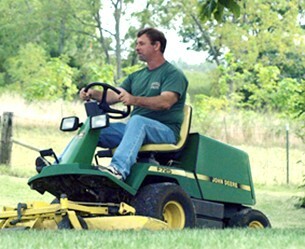 The owners of larger estates often have professional mowers they purchased to mow their own lawn. You may be able to pick up a gently used quality mower and trimmer at a fraction of the new price. Time is money. This is especially true in a business where you are being paid a fixed price. Believe it or not, often hiring an employee can be a good thing. Once you reach a certain point in your business, having a second person to do the string trimming and push mower work, while you are on the riding mower can save a tremendous amount of time. Large commercial lots can be done quickly with two people on riding mowers. For example: Some people with an employee will charge for a job based on how long it will take one person to do the job. If you charge $50.00 an hour and you bid two hours for a large job (Price based on how long it takes for you to mow it by yourself), you will get paid $100 whether it takes you one hour or two. If there is a lot of fence or trees to trim around, that requires a lot of time. With a good employee, you can cut your time in half and finish the job in one hour. The employee is working the string trimmer while you are zipping back and forth on the riding mower. The extra 50 dollars will more than pay for the hour of employee time. With the extra employee, you can be driving to the next job in a little over an hour compared to doing the job alone. Pricing a job this way works best if you have larger lots to mow or the homes are in close proximity so drive time is short. This requires that you have enough work to support the extra employee. You may also want to look into worker's comp. insurance. By law, with one employee you may not legally have to get it, but it is a small cost if your employee gets seriously hurt. This is another expense you will need to consider. Remember, also, if someone is charging less than you, it is not always that he is lowballing. It may be that the person has figured out how to work smarter, got his equipment and materials at a lower cost, is more organized with his time and has some great employees. He may be making the same amount in profit as you are, but was able to bid less and got the job instead of you. This separates the true professionals from the amateurs. You owe it to yourself to look at all angles when pricing a job, so you get the job instead of someone else.